Over the years we have seen various attempts from AMD and Intel to try and help improve storage performance on their mainstream platforms. Because of the solid user experience benefits that solid state storage can bring, these attempts come in two forms: to make the most of a small amount of super-fast storage, or to expand the amount of super-fast storage available. Most attempts at this have been laborious, such as Intel’s caching technology that allows a SSD or 32GB of Optane Memory to act as a quick read/write cache for a rotational drive. AMD’s latest attempt to boost the storage performance is Enmotus FuzeDrive, a collaborative piece of software that is designed to combine several storage devices into one big disk. The principle is fairly simple: take any combination of rotational hard drive, SATA SSD, NVMe SSD, and even DRAM, and this software will create a single drive that addresses them all. The software and drivers will manage what data goes where for quicker access, rather than it appearing as one big JBOD. The obvious red flags from the press were about DRAM, which we were told will only act as a read-cache from prepared data taken from the other drives. The other flag was about if one drive in that system fails, whether all the data is lost. The answer was a likely yes, and so the risk of such a system might be in-line with a JBOD array or similar to a RAID-0, but without the predictable speedup a RAID-0 array might bring. Predictive caching technologies to help speed up read/write access times are, on paper, a good idea. Some SSDs already do this, by having a small amount of fast SLC cache to act as a write buffer, which the controller can then move the data around to empty the cache when the drive is idle. The difference between having something like a controller manage an embedded system and a general software package in play is that the embedded system has to work for a single drive, albeit millions of units. That arrangement is going to be as defined and engineered as much as that SSD vendor wants it to be. For a software package, it has to work across a variety of environments that might be badly configured, or in situations that the software might not be able to identify properly. As the software stretches over three or four different drives, it sounds like a potential failure in the making of one of those drives decides to die. 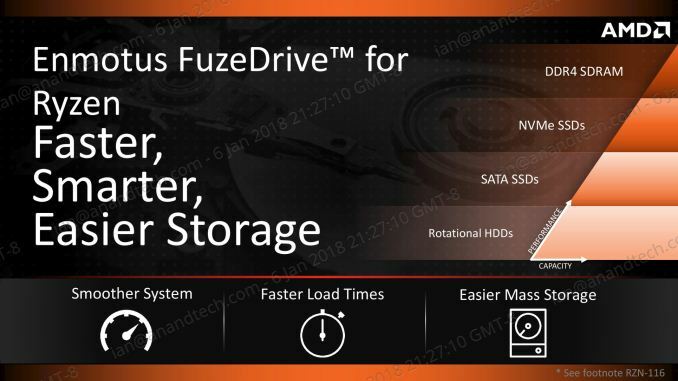 AMD lists several benefits of FuzeDrive: no Windows reinstall required, drives can be added to the pool at any point, or removed from the pool if sufficient spare space exists. Pools with DRAM added can be configured manually if some more DRAM is needed. AMD lists that in its testing, comparing a 500 GB hard-drive to a system with a Samsung 960 Pro added to the pool, they recorded a 578% faster Adobe Premiere launch, and a 931% faster Adobe Photoshop launch. I could see FuzeDrive being useful in two particular scenarios: If a user as a small (32-128 GB) NVMe drive and a 1TB SSD/HDD, a single pool can be made. Users with a single large drive (SATA or HDD) could use the software to add DRAM, enabling an automatic RAM disk. Enmotus FuzeDrive will be available for Ryzen Desktop systems, and will cost $20.